Keywords are the bread and butter of Google search advertising. So it makes sense to use keywords best practices across all your accounts. If you don’t, you may not maximize your marketing ROI. Meaning your business loses out. Instead, you want your business to win. And to do this, you have to use time-tested techniques and strategies. We’ve also developed an in-depth Keyword Research Guide for Marketers to streamline keyword research, implement best practices, and improve search engine rank for valuable keywords for download. Here are five best practices you should use when it comes to your keywords (plus a bonus tip). What are you trying to accomplish in your search campaign? Different campaigns have different objectives. And your keywords need to reflect these goals. If your business goal is to build awareness, you’ll advertise content to get your brand out there. Maybe content like an infographic. Use the type of content you’re promoting as a qualifier. This means attaching keywords to your product or service that satisfies the searcher and your objectives. For example, attaching the keyword “infographic” to variations of your product or service, e.g. Do the same for your demand gen and lead gen campaigns. Align keywords with your business goals using the right qualifiers. The power of keyword match types couldn’t be more understated. A match type is what triggers your ads to show for different search variations. Depending on your industry, product, or service, this can make or break your search campaigns. 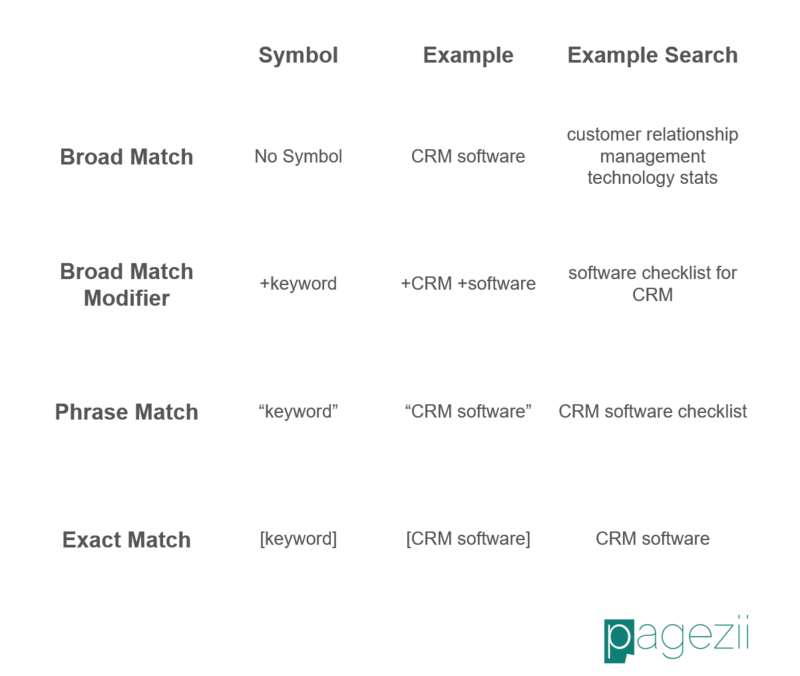 Above is a basic breakdown of Google’s keyword match types. But let’s dive a bit deeper into each category. Broad match keywords are good for catch-all search queries. Google uses its algorithms to match a related user search with your target keyword. If your target keyword is in the vicinity of the user search, Google may choose to display your ad. Broad match modifier lets you control search variation. The modifier tells AdWords you want to see certain keywords present in a query. Phrase match tightens the leash quite a bit. 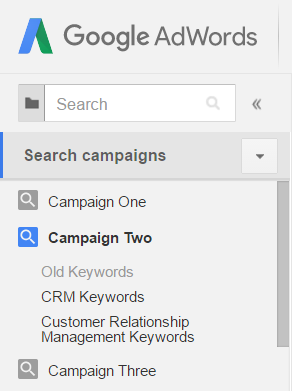 Now you’re telling AdWords you want to see certain keywords in a certain order. But there can be other keywords in a query before or after. Exact match is as tight as you can go. This means you only want people searching for specific keywords and nothing else. Moving down the matching options means tighter control. It also means less traffic. Too broad and you could blow your ad spend quickly with nothing to show for it. Too tight and your ads may not see the light of day. Test matching options to see what give the best results. Now you’ve learned how to use matching options like a seasoned vet. It’s time to start building keyword lists. Segmenting your keywords is the foundation of an organized search campaign. It helps you understand what keywords bring value. And as your campaigns progress you can focus more of your time and spend on certain keywords that work for your business. In the example above, you can see how I segment keywords. I have three search campaigns. Each with their own objectives. In each campaign, I have ad groups. This is where I segment keywords. In Campaign Two I have three ad groups. The first ad group I’ve labeled “Old Keywords”. This could have been the keyword lists I started out with. I then use two ad groups to segment “CRM” and “customer relationship management” keywords. Over time I’ll see which keyword segment provides higher value for my business. This means more effort and ad spend going towards these keywords. Filtering unwanted keywords means my ads won’t show when someone uses a certain keyword. To filter out unwanted keywords, use negative keyword targeting. A negative keyword blocks a user from seeing your ad if the negative keyword is present in their query. It works like this. You’re a CRM software company and target CRM as a keyword. For your business, CRM means Customer Relationship Management. 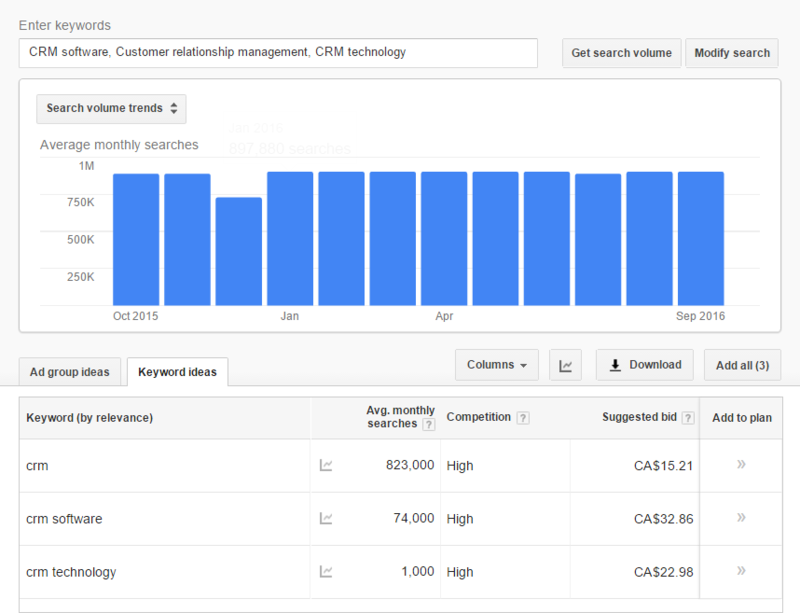 But for searchers, CRM could be something totally different. For the search query above, you wouldn’t want your ad to show. This searcher has no interest in CRM products. Yet the searcher may click your ad because it shows first above other results. And what happens when they land on your page? They bounce right away. Leaving you with nothing but less daily ad spend to work with. This is why negative keywords benefit you. Negative keywords can save your AdWords account from the wrong users clicking on your ads. This saves ad dollars which you can spend on quality visitors interested in your products or services. Every campaign can use negative keywords. Make sure yours does too. Always be on the hunt for new keywords to keep your AdWords account ahead of the curve. When you spot new keywords, run them through the Google Keyword Planner. This gives you an idea if the new keywords are worth targeting or not. Average Monthly Searches – The average number of searches for the keyword and its close variants. Competition – The number of advertisers that show on each keyword relative to all keywords across Google. Suggested Bid – Google calculates suggested bid by looking at the costs-per-click that advertisers are paying for a keyword. You’ll also see if search volume for new keywords is on the rise. What you want to see here are search volumes increasing monthly, with low competition and bids. That’s a keyword win. I also wanted to share a keywords best practices bonus tip you can use to run a tight keyword-targeting ship. Take advantage of AdWords “Search Terms”. Search Terms shows you what users search for before clicking your ads. This can let you in on new keywords and also block out keywords resulting in low-quality traffic. This should be your go-to tab when checking keyword performance. Sure, check your ad groups and see which targeted keywords are getting the best click-through-rates and conversions. But this tab shows you exactly what users search for before that click or conversion. Stay on top of your keywords by keeping tabs on user search terms. You now know the keywords best practices to run your AdWords accounts like a pro. These best practices are for on-going management – they’re not one-and-done techniques. As you continue to use these techniques, you’ll become sharper and know which ones you need to use at what times. Do you have any keywords best practices you like to use? Let us know in the comments below. Was this keyword post helpful? If so, you’ll find our other downloadable resources useful as well. You can grab them from our main resources page.